Two Chicks On Books: Vote for Alex in the Heroine Tourney! So our girl Rose lost in the YA Heroine tourney to the awesome Alexandra Andros from Half Blood and we couldn’t have lost to a better girl! As promised we are throwing our support behind Alex for the rest of the tournament for however long she’s in it. Her advocate Momo from Books over Boys and Jennifer L. Armentrout the author of this amazing series have been hard at work to find some incentives for this round of the tourney. For those of you who don’t know, Alex is facing Katniss (eek) it’s going to be a tough battle! 1500 votes: a teaser from Shadows. Also Momo still has her giveaway going on her BLOG for Daimon, Half Blood, and Pure so make sure to go and enter! Were those incentives enough for you? 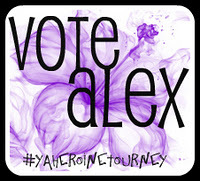 Go to the YA Sisterhood’s BLOG and vote for Alex! I too was sad that Rose lost in the last round to Alex but I really liked how amazing and positive everyone was during the voting. Everyone kept it fun so I have decided to support Alex as well. Thanks Nicole! Yeah that's how we like to do it we love Alex and her advocate so there would never be any bad mouthing between our teams :) not like some of the other matches we've seen. GO ALEX!! It's been so fun watching this tourney! :) I'm 100% Team Alex and I can't wait to see how it all turns out! Thanks so much for the post! :) I really hope Alex will pull through with this match!